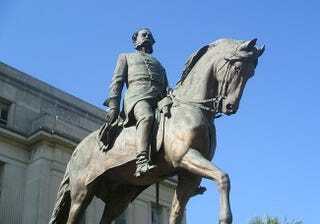 Tracing Your Roots: My Confederate Ancestor Is on Monuments; Who Did He Own? The debate over Confederate monuments inspires one woman to find the descendants of people her memorialized ancestor enslaved. I just read your previous column regarding the Confederate general Wade Hampton III, of whom I am a direct descendant. In it, you addressed whether there was a connection between Gen. Hampton and a man named Wade Hampton Shields, whose parents were born into slavery. I would be really interested to know more about the descendants of the people he enslaved. How can I research this history? The controversy over the Confederate statues is obviously of interest to my family, especially those located in the U.S. Capitol rotunda, where my ancestor is memorialized. Healthy discussion and dialogue would be very important at this time. In the opinion of Professor Gates, the debate over where statues and memorials of Confederate soldiers belong in 21st-century America can only be resolved with, as you say, healthy dialogue. However, that discussion must also be honest about the war that fractured our nation and the central role of slavery in the conflict. It’s important to talk about the pain that Confederate monuments cause to African Americans and others, as well as the context in which such monuments were erected during the post-Reconstruction era and during subsequent times of racial tension. It’s also important to note that historical figures such as your ancestor, a Confederate lieutenant general who later represented South Carolina as governor and U.S. senator and was a prominent critic of Reconstruction, were honored in their time. Clearly, leaving the status quo in place is not an option. It’s time for discussions that are open to all within the communities that house these monuments, and decisions on their fate should happen democratically. That being said, perhaps the best solution is to take statues down from their places of honor and put them in their proper historical context in museums. Many people argue that to simply tear down and destroy them erases evidence of our history. There is a role, as well, for teachers and historians to help communities obtain the facts about the monuments and the people and events they depict, while seeing the broader landscapes of our past. If these public monuments once distorted our history, it’s better to repurpose them now to teach the full complexity of American history by putting them in museums. Or we could leave them in place and surround them with signage or, better yet, additional monuments that speak to our strength and diversity. Why not put statues of abolitionist warriors such as Harriet Tubman and Sojourner Truth alongside Confederates such as Robert E. Lee and Wade Hampton III? As for reaching out to the descendants of those your ancestor enslaved, we encourage you to do so with sensitivity to the fact that while some may embrace knowing more about your common connection, others may wish to leave the past in the past. The best approach is to share the information you have uncovered about an enslaved ancestor, listen to and respect how they respond to it, and then go from there. As it is, we found a few leads you can follow up on. A biography on Wade Hampton notes that his father died in 1858 and Wade inherited his estate. Given that Wade Hampton III was the third man with that name, we worked on the assumption that his father was also Wade Hampton (for the sake of keeping track, we’ll call him Wade Hampton II). Wade Hampton II’s probate file is recorded at Richland County, S.C., Box 46, Package 1144 (via FamilySearch; free registration required). The first page in the packet states that Wade Hampton and Christopher F. Hampton applied for letters of administration on Wade Hampton II’s estate, suggesting that Christopher Hampton was Wade Hampton II’s son as well. It is important to keep this in mind, as not all of Wade Hampton’s property may have gone to Wade Hampton III. While it’s terrible to contemplate that people were appraised in this way, looking at the recorded value given can give you an idea of the age of an individual. People in their late teens to their 30s were generally given a higher value than those who were older. There is no real way of knowing for sure, but it is possible that the list was made in family groupings, so you could search in later records for groups of people living together. Keep in mind when you are following up on the people named in this inventory post-slavery that their surnames may or may not be Hampton. One strategy to find those formerly enslaved by your ancestors would be to look at the 1870 U.S. census record for Wade Hampton III and see who is living near him. It is likely that at least some of his former slaves remained in his immediate vicinity, so you could search his neighbor’s households for anyone with the names recorded in Wade Hampton II’s probate inventory. For example, further down the census record page from Wade Hampton’s household is a Sylvia Jones (born about 1846), and Sylvia is a name that is repeated a number of times throughout Wade Hampton II’s probate inventory. Also close to Sylvia Jones was an Ishmael Barnes, and an Ishmael was also recorded in Wade Hampton II’s inventory. This all suggests a connection. Another option would be to search the Freedmen’s Bureau records for mention of Wade Hampton as a slave owner. Sometimes when formerly enslaved individuals made work contracts or used some other service provided by the Freedmen’s Bureau, they would be identified as the former slave of their slave owner. We did a search for the name Wade Hampton and restricted it to records from South Carolina and located a labor contract between Nathanl. F. Byman, proprieter, and Spencer Wilson “late slave of General W. Hampton,” dated Jan. 27, 1866, recorded at Richland, S.C. You will want to note that there was a “Spencer” valued at $700 in Wade Hampton II’s probate inventory that could be the same person in this record. You can continue to try to trace these individuals forward in time. Since the work contract we located was from 1866, we searched for Spencer Wilson in the 1870 U.S. census. We did not locate anyone with the name residing in Richland, but there are two that would have been old enough to have signed the labor contract residing in nearby regions. One of these was a Spencer Wilson residing in Charleston, S.C., born about 1840 and working as a domestic servant. He was recorded as “mulatto,” while his wife and children were “black.” Also in the household was a Silvey Mitchell, born about 1837, who was working as a cook. We noted this because, again, the name Sylvia was associated with the former slaves of Wade Hampton II. There were 252 enslaved people recorded in the probate inventory of Wade Hampton II. This is a large number of individuals to trace forward in time. Another strategy you may try is to take some of the more uncommon names, such as “Monday,” “Shadrock,” “Larkin” and “Primus,” to name a few, and search the 1870 census just for these first names residing in Richland County, S.C., and try designating the race search option to “black” or “mulatto” to see what the results yield. This would account for if the individuals had a surname other than Hampton. You will want to look for anyone who would have been alive in 1858 to be counted in the inventory, and then try to follow naming patterns or households that appear to have a number of names recorded in the inventory, as this would suggest that they were likely related to those whom Wade Hampton enslaved. Once identified, you can then work to trace those families forward to see what more you can learn about them. This answer was provided in consultation with Meaghan E.H. Siekman, Ph.D., a senior researcher from the New England Historic Genealogical Society. Founded in 1845, NEHGS is the country’s leading nonprofit resource for family history research. Its website, AmericanAncestors.org, contains more than 1 billion searchable records for research in New England, New York and beyond. With the leading experts in the field, NEHGS staff can provide assistance and guidance for questions in most research areas. They can also be hired to conduct research on your family. Learn more today about researching African-American roots.